Heard enough news about high definition televisions you'll never be able to afford? Well, how about checking out the other end of the market for a tiny screen that's about as low-def as they come? 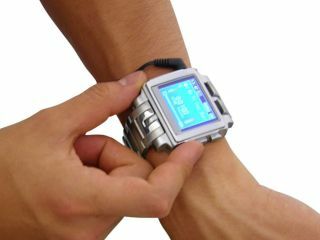 The latest far-out gadget from Thanko Japan is a wristwatch video player. It has a screen resolution of just 160 x 128 pixels spread over 1.5 inches, taking it just a fraction of the way to HD TV land. At ¥19,800 (£81) for the 2GB version or ¥25,800 (£105) for double that, the MP4 Watch Metal isn't exactly the cheapest of gimmicks. But it certainly has a lot to offer. Video playback can be in any of the AVI, MPEG or WMV formats, while MP3 and WMA are supported on the audio front. Should you wish to pack a photo album in too, there's an image viewer that likes BMP and JPEG files. In case you were wondering, connection to a PC is through a super-small USB port on the watch itself. Battery life is rated at 10 hours for audio playback and four for video, and charging is done through the included AC adapter or by USB. Lastly, as well as all that miniaturised goodness there's a voice recorder and even the ability to tell the time - what more could we ask for?